Dont Be A Conventional Greenhouse Dreamer! Come Out Of The Mould, Build Your Own And Let Your Greenhouse Give A Better Yield Than Any Other In Town! Discover How You Can Start Your Own Greenhouse With Healthier Plants Anytime Of The Year! Finally! You Can Now Instantly Discover Some Awesome Tips To Take Greenhouse Growing To The Next Level! Learn How You Can Get A Better Yield, And Even Better Maintenance Ideas! And See Your Buddies Jaws Drop To The Floor In Sheer Amazement! * How Does A Greenhouse Capture Heat? * What Makes Up The Greenhouse Structure? * Thinking Of Buying A Greenhouse? 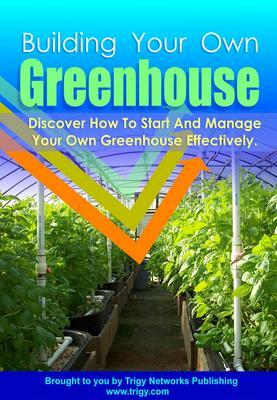 Why spend another weeks and months trying to figure out all of the steps it takes to start your own greenhouse when you can get now the guide that will show you exactly how to take action to Building and maintain your own successful greenhouse?